ISIS profits from destruction of Dura Europos and other ancient sites — 1389 Blog - Counterjihad! The expansionist Islamic State (of Iraq and ash-Sham/Levant/ISIS/ISIL) poses a genuine danger, not only to what remains of Judaeo-Christian civilization in the Middle East, but also to their fellow Muslims. Why are the evil deeds of this self-anointed “caliphate” not reported in the media every day? We know the answer. These satellite images document the scale of destruction that looters continue to inflict on archaeological heritage sites during the ongoing conflict in Syria. Looting at archaeological sites destroys irreplaceable evidence of life and society in the ancient world. In the case of Syria, this evidence has helped researchers understand important historical developments such as the beginnings of agriculture and cities, the rise and fall of empires, and the development and spread of Judaism, Christianity and Islam. 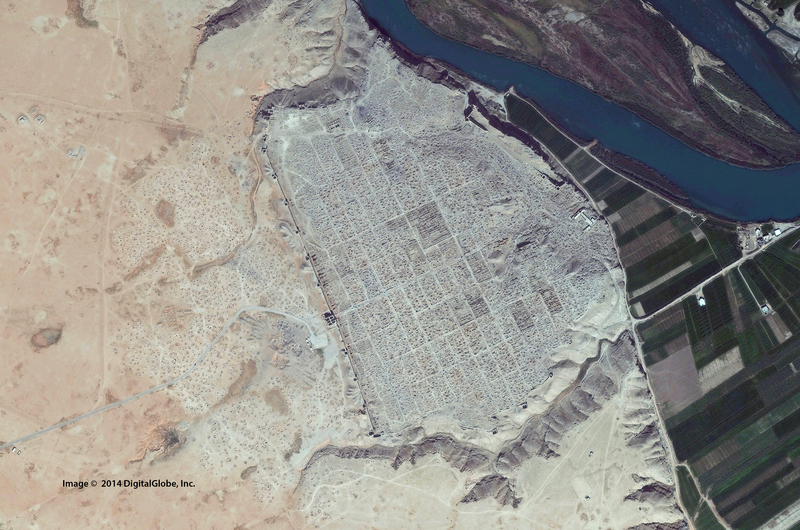 Syria’s rich archaeological corpus includes several ancient settlements on the UNESCO World Heritage List and Tentative List and many others that help us understand the mosaic of human history. 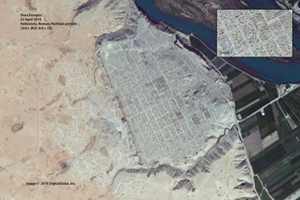 This unique Classical-period site, founded in the 3rd century BC and occupied until the 3rd century AD, demonstrates the diversity of the ancient Middle East. One of the world’s earliest churches was discovered here, as was one of the oldest preserved synagogues and numerous temples devoted to polytheistic deities. This important site of approximately 150 acres (60 hectares) is now covered by looters’ pits. Why is the Dura Europos archaeological site so important for Orthodox Christians? The remains in Dura Europos of the early Orthodox Christian house church and the Jewish synagogue confirm that both the early Orthodox Church and the Jews used religious iconography during Roman times. This refutes the claims of modern-day Protestant and Muslim iconoclasts who maintain that the use of any religious representation is an innovation that flouts the biblical prohibition against making “graven images” for worship. I have recently written about the archaeological discoveries of ancient Christian house churches in the middle east. In that piece, I discussed how the manuscripts found at these sites shows us that a central practice within these early church communities was the sacrificial mystery of the holy Eucharist (along with baptism), and very much in a way that is consonant with later Eucharistic rites of the fourth century, as well as the rites described in the first-century Didache. I also alluded briefly to the iconographic frescoes in these churches (both at Megiddo and Dura Europos), but I’d like to dive into that aspect a little further. Up until the late-19th century, it was a common polemic of Protestant apologists (against both Rome and the Orthodox Church) that the veneration given to saints was a late innovation and even degradation of the faith (perhaps as late as the fifth or sixth century). Not only this, but it was an established presumption that Judaism (in this case, Second Temple Judaism, as at the time of Christ and his apostles) was wholly iconoclastic, and that it would be impossible to imagine how the early Christians could have ever developed an iconographic tradition, as a result—given both their heritage and dependence upon the Judaism prior to Christianity. However, there is now an abundance of evidence to the contrary, beyond the pale of the Orthodox-Catholic tradition. From the standpoint of popular traditions, most are aware of the “Icon Made Without Hands” that the Lord imprinted into a cloth and gave to King Abgar of Edessa (reigned A.D. 13–50) of the Osroene Kingdom. There is also the tradition of Luke the Physician painting the first icon of the Theotokos (the Virgin Mary) and the infant Jesus (the Hodegetria, which is currently enshrined at a church on Mount Athos). Eusebius of Cæsarea even wrote about the existence of icons and statues of Christ, which had existed well before his time (A.D. 263-329): “Eusebius tells of a statue said to be that of Christ which existed in Palestine, and did not think it strange. He had heard too of portraits of Peter and Paul” (The Orthodox Liturgy, p. 23). It is quite probable that Christians began painting portraits of distinguished and venerated members of the Church very early on. The Apocryphal Acts of John tell of a portrait of the Apostle which one of his disciples, Lycomedes, commissioned from an artist friend. Lycomedes put it in his bedroom, and adorned it with flowers. Besides basic portraiture, the funerary art tradition in the early Church is easily demonstrated in the Roman catacombs. There is little doubt that Christians followed contemporary practice in having funerary portraits painted of distinguished church members . . . and perhaps as early as the third century, Christian images were venerated by being garlanded with flowers and having lights burnt in front of them. But what about the supposed iconoclasm of Judaism? Wouldn’t this have prohibited the advent of both iconography and statuary among the early Christians? On the contrary, and in agreement with the traditions of the Church, Judaism of this time was emphatically not iconoclastic, nor was Judaism itself ever really monolithic with respect to many key beliefs. Indeed, there have been some rather important archaeological discoveries in the past century or so that have debunked this position entirely. If one is being honest about the witness of the holy scriptures, we must admit that there are several approving commandments related to the creation of iconography and even statuary in the old testament. Both the tabernacle and temple were adorned with a multitude of images, both two- and three-dimensional, which depicted everything from angels to pomegranates—the priest would prostrate himself before these images and statues, no less. The temple was filled with a glorious array of colors and images, with theological symbolism underlying it all. And with the incarnation of Jesus Christ, this more “symbolic” iconography transitioned to a more Christian or incarnational pattern (1 John 1:1–3), with the image of Christ, the saints, and his holy Mother. 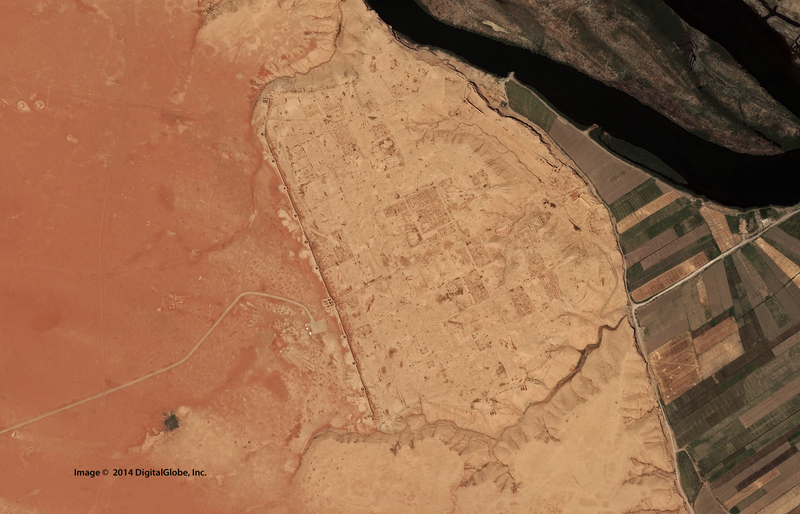 The Christian “house church” (and synagogue) discovered at Dura Europos (ca. A.D. 235) are about as explicit as can be when it comes to demonstrating—in an historical and archaeological manner—the existence of iconography within both Jewish and Christian architecture of the post-resurrection era; and importantly, in both cases being in the context of places of worship. The archaeologist discovered that three of the covered homes had been renovated for use as religious buildings. 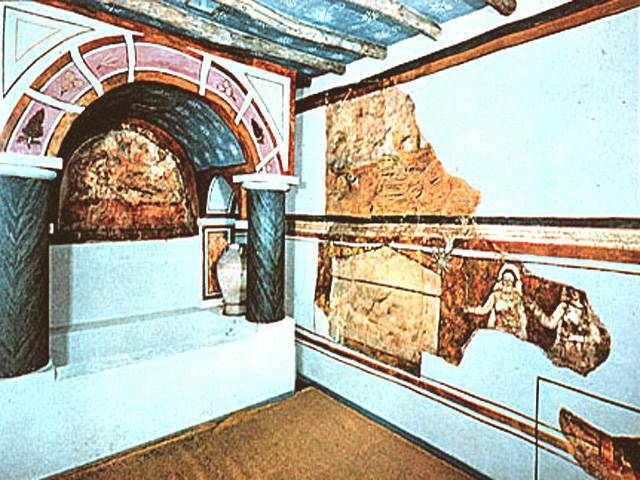 One had become a Mithraeum, dedicated to the worship of the god Mithras. Another had undergone structural modifications to become a Jewish synagogue. The third home had been converted to a Christian church. This Christian church is especially important as it is the earliest complete church extant. Note that last statement. At the time of its discovery, this was the earliest extant Christian Church preserved to the present day. This goes beyond mere speculation as to what the “early church” was like, but is the early church itself staring back at us from across the centuries. The arrangement of the church at Dura Europos reflects the well-established liturgical practices of the Christians, with a place for a Baptistry, an altar table for the bishop to oversee the celebration of the Eucharistic feast, and—last but not least—iconography. This discovery is, again, in harmony with the tradition of the Orthodox-Catholic Church. However, for those who look upon the tradition of the Church with any amount of skepticism or disdain, the existence of such archaeological evidence should be, at the very least, intriguing. ISIS is destroying the world’s cultural heritage in the name of jihad — 1389 Blog - Counterjihad!